Laboratoire Matière et Systèmes Complexes - Séminaire MSC. 28 mai 2018. Jure Derganc (University of Ljubljana) : "Controlled Shaping of Giant Lipid Vesicles : a First Small Step Towards Bottom-Up Fabrication of Synthetic Membrane Organelles ?" Accueil du site > Séminaires > Archives séminaires > Séminaires 2018 > Séminaire MSC. 28 mai 2018. Jure Derganc (University of Ljubljana) : "Controlled Shaping of Giant Lipid Vesicles : a First Small Step Towards Bottom-Up Fabrication of Synthetic Membrane Organelles ?". 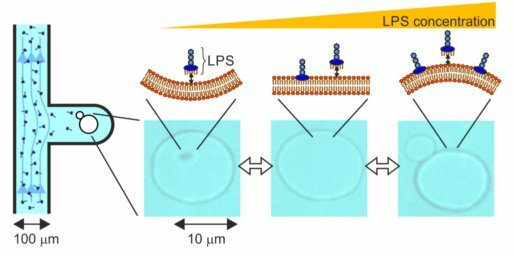 Controlled Shaping of Giant Lipid Vesicles : a First Small Step Towards Bottom-Up Fabrication of Synthetic Membrane Organelles ? Many important biochemical processes in cells depend on membrane proteins that reside in membrane compartments with large area-to-volume ratios, such as the mitochondria or the chloroplast. Yet, despite significant advances in synthetic biology and biophysics of lipid bilayers, methods for controlled shaping of lipid membranes into synthetic organelles remain scarce and the use of synthetic membranes is limited predominantly to spherical vesicles. The main experimental challenge in membrane shaping is that non-tensed membranes are remarkably soft, undergo noticeable thermal fluctuations and can irreversibly warp under a slightest hydrodynamic flow. Here I will present a novel approach for controlled shaping of giant lipid vesicles by regulating osmotic conditions and the concentration of membrane-shaping molecules. The method is based on the microfluidic diffusion chamber, where the solution surrounding soft biological samples can be repeatedly exchanged solely by diffusion, without any hydrodynamic flow that could deform or flush away the sample . I will show our first results on shaping of giant lipid vesicles at moderate area-to-volume ratios  and discuss some of that lie on the path towards a controlled bottom-up fabrication of synthetic membrane compartments with large area-to-volume ratios. References :  Vrhovec et al. Lab Chip. 2011, 11, 4200-4206. Mally et al. RSC Advances 2017, 7, 36506-36515.